The ener.CON Europe offers you the unique opportunity to position your business in front of leading energy efficiency experts and is designed to maximise your time with your target audience and new business prospects. From the thought-provoking plenary and business stream sessions to networking at the Icebreaker and World Café sessions, your company will be front and center. Do you have a solution or product and want to present, exhibit or meet active buyers? The FUERGY is the name for an entirely new energy ecosystem that provides AI-powered surplus energy trading for all of its participants. Our goal is to build an ecosystem that will consist of an unlimited number of nodes— market participants. An ecosystem where electricity will be produced and consumed more efficiently, where there will be no need to build new distribution grids because it will become easier and more effective to use existing ones. We want to achieve the point when even the smallest consumer will be able to benefit from the opportunities that large participants already have. Also where green energy producers will be rewarded and renewable sources will be affordable for the masses. This ecosystem will no longer create negative externalities and will be fair and profitable to all relevant participants at all levels. Energy21 is founded 21 years ago and has since established itself as a longterm partner for renowned energy companies and facilitator for new entrants. By combining our expertise of the energy ecosystem and our digitalisation capabilities, we transform relevant data into actionable insights based on the clients‘ processes and within their regulatory framework. These insights enable clients to achieve their sustainability goals, improve cost effectiveness and capture market opportunities while guaranteeing security of supply. Our digital tools include the latest developments in database technology and, in addition, an in-house developed calculation engine to handle exceptionally large data streams (such as complete industry site measurements). As a result we offer field proven and practicable measuring instruments for compressed air and gas like e. g.: Dew point meters, pressure dew point meters for refrigeration and adsorption dryers (according to ISO 8573), flow meters / consumption meters for compressed air and gases, leak detectors and software solutions to analyze and monitor those measurement devices. 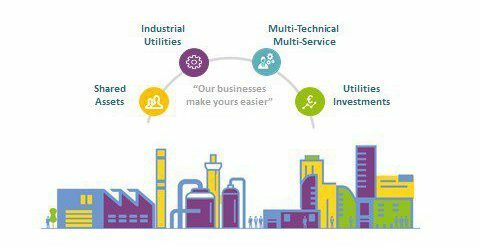 Veolia Industries Global Solutions provides outsourcing solutions for industrial clients in the area of plant utilities and infrastructure related asset maintenance and operations. As part of the Veolia Group – the Global leader in Water, Waste and Energy management – and with more than twenty years of experience in Integrated Facilities Management we bring the combined expertise of Veolia to our industrial clients. Typical engagements involve multi-county, multi-site and multi-technical solutions governed under a single contract structure with lean management structure, leading to highly optimised performance, realisation of new value from assets and impressive savings on overall operations thus increasing our clients agility and competitiveness. We will be happy to share with you how Veolia is breaking new ground in the area of facilities energy and resource management through our proprietary Hubgrade system and to show you our approach to world class Asset Management and minimising overall total cost of ownership. High-tech company Nedap creates high-quality, innovative hardware and software products that enable people to be more productive and successful in their professional lives. Nedap has a workforce of over 680 employees and operates on a global scale. The company was founded in 1929 and has been listed on Euronext Amsterdam since 1947. Its headquarters is located in Groenlo, the Netherlands. Luxon is a connected light management platform to manage your lighting online and accelerate savings. Lights are wirelessly controlled and only switched on where and when needed. In addition, the Luxon platform provides clear insights in performance and usage, allowing for future optimizations and proactive maintenance. With the help of different dashboards, Nedap enables users to manage lighting within all their business locations online using one system. Luxon is luminaire brand independent and easy to combine with all luminaires of choice. Luxon’s platform architecture is a perfect fit for Lighting-as-a-Service (LaaS) models, in which the end-user gets access to the most energy-efficient lighting without the need to invest. Core functionalities, such as automated maintenance alerts and remote accessibility enable LaaS providers to deliver a true service, whereas real-time energy metering supports transparency in performance. In DNV GL we unite the strengths of DNV, KEMA, Garrad Hassan and GL Renewables Certification. DNV GL’s 2,500 energy experts support customers around the globe in delivering a safe, reliable, efficient, and sustainable energy supply. We deliver world-renowned testing, certification and advisory services to the energy value chain including renewables and energy efficiency. Our expertise spans onshore and offshore wind power, solar, conventional generation, transmission and distribu¬tion, smart grids, and sustainable energy use, as well as energy markets and regulations. Our testing, certification and advisory services are delivered independent from each other. AB is the World’s Foremost Authority Specialized in Cogeneration Plants. Since 1981, AB has been at the side of companies seeking to improve their own competitiveness, saving energy and limiting environmental emissions. We create a relationship with our customers and partners based on frankness and trust: we produce, install and manage the plants as if they were ours. Over 30 years of work, we have developed a know-how and a production capacity without equal on a world-wide level, which ensure the excellence of the plants, the maximum quality of both the installation and after-sales service. Because AB is the only manufacturer, with an industrial process able to internally manage the entire production cycle of the cogeneration plant. AB pursues the highest degree of innovation with determination, gathering knowledge, experience and technologies, in order to respond with advanced solutions to a primary need of mankind: energy. Contributing to the creation of a better future in the direction of an eco-sustainable system. The principal production and engineering research activities are concentrated in a modern industrial hub with its head offices in Orzinuovi (BS) Italy, spread over about 40,000 mq of connected buildings, where the production facility, engineering offices, service centre and management are located. VPInstruments has been founded over 15 years ago, to provide fundamental, easy to use solutions to measurement problems, with two eyes for detail. You can still find those two eyes in our company logo. These are the two eyes that we keep focused on your energy consumption, so you can focus on improving your processes. Our three-in-one flow meters are based on proprietary sensor technology (Thermabridge) and enable you to measure mass flow, flow direction, pressure and temperature. This is the only way to get a complete picture your energy consumption, which ultimately leads to the right savings meaasures. Our three in one products are used by customers worldwide to save them a great deal of money and energy. Together we can make a difference by saving significantly on production costs at your organization. At the same time we will make our planet a better and healthier place to live. We feel responsible for the quality of our products and the level of service we provide to our customers. We also care about the environment, leading to creating products that last and make a contribution towards energy savings. The VPFlowScope product line gives insight in compressed air systems and helps you find energy losses. Compressed air is a very expensive energy source. In fact it can be about 20 times more expensive than electricity. In many cases, compressed air is wasted due to leakage, non-optimal compressor configurations or misuse. Our products can help you improve and optimize your compressed air system. Your return on investment is a matter of months. Take a look at our savings success stories and read how our products helped other companies to save large amounts of money year after year. Our products can be found all around the world. About 90% of our customers are from outside of the Netherlands. We serve many industries, for example automotive, glass manufacturing, cement, food and beverage, consumer goods. Are you ready to save some compressed air? You can contact one of our authorized distributors, or you can contact us directly if your country is not in our listing. Feel free to contact us if you want to become a distributor. …in it for you – and why partner the ener.CON Europe 2020? Meet 120+ heads and leaders, engineers and plant managers responsible for energy efficiency and maintenance from asset intensive industries and leading market players at your booth, at sessions, roundtables, in workshops and more. Talk to the people you’re there to meet in more than 30 hours of networking . Host your own private breakfasts & lunches, One2One meetings, cocktail parties… Your prospects will get back to the office with your brand on their minds! Showcase your solutions and run product demos to drive demand amongst your target market. Benefit from our dedicated and extensive marketing campaign to assemble the global and loyal energy efficiency community from asset intensive industry. Promote your business as a thought leader in energy efficiency and maintenance and launch your new product or business solution saving resources and energy at the event. Get your product in front of the right buyers – senior level executives and leading professionals aiming to solve the most pressing challenges and solutions, technologies, trends and best practice innovations in the field of energy efficiency. Take the chance to create invaluable networking opportunities, providing a social and enjoyable environment to meet with all conference attendees and speakers. Drive sales leads pre, during and post event. Discover who else is participating at the 8th ener.CON Europe. Our unique Polaroid Picture Wall will help you identify who you want to meet at the conference. MESA (Manufacturing Enterprise Solutions Association) International is a global community of manufacturers, producers, industry leaders and solution providers who are focused on improving Operations Management capabilities through the effective application of technology solutions and best practices. Industry of Things Voice is all about Disruptive Technologies, Internet of Things, IT, IoT, Cyber Security, Continuous Delivery and DevOps. We gather the latest information, case studies, innovation studies, videos, surveys and exclusive interviews on these topics shaping the future and give most important opportunities & challenges their deserved space online. As the only media brand on the German market our trade journal IT&Production informs exclusively and comprehensively about every aspect of the industrial IT – and we have done so for already 17 years. Decision makers, managers of production-related departments and IT Managers of every sector can find information about investment decisions and innovative technology in our range of services. In the Industrie 4.0 era that we are living in you need the right software, hardware and efficient processes for sustainable success on the global market – so our content is more in demand than ever. As a medial companion of the industrial digital transformation, we work closely together with central stakeholders to offer our readers useful information for their operational practice. The spectrum of our topics ranges from the management level over research and development to manufacturing, automation and services. The topic of digital engineering is to all all engineers active in development of and/or responsible for the practical implementation of innovative products, processes and production methods. Because competitive pressures are going to continue to increase, companies need to effectively connect all applications in the entire value chain. As one of the leading journals in the construction and engineering sector, DIGITAL ENGINEERING Magazin provides a high utility value to designers, engineers and decision-makers. The solutions and examples presented here help them to develop better and more cost-effective products and processes. Shorter product life cycles, increasing variety, dynamic markets and intensified competition characterize the environment of manufacturing companies today. But not only the large companies are faced with these new challenges. SMEs as well are forced to improve their production methods, making them more efficient and economical. Used properly, the methods and IT tools for the production area provide a significant contribution to efficient, cost-effective and thus competitive production. The magazine focuses on fundamentals, methods, technology trends, IT solutions, and practical examples from the field of digital process chain and production. Digital Manufacturing conveys the notion that productivity gains can be achieved by using efficient IT solutions in production, and as a result presents the solutions that are available, and the vendors present in the market. The journey is its own reward, and therefore the Digital Manufacturing looks at innovative, future oriented subjects like Industry 4.0 and Green Production. ChemExecSM | Executive Club is an exclusive online Club offering faster, simpler networking for chemicals, materials, resources and bioscience professionals on a worldwide basis. Please join us. gwf Gas + Energie is the leading technical and scientific b2b-journal for all aspects of recovery, production, distribution and use of natural gas, gas in general and aspects of green gas in combination with the energy sector in Germany. gwf Gas + Energie informs about the gas industry, the gas supply, transportation, storage and trade, the gas market and its regulations, the pipeline engineering, repair and prevention, the measurement, controlling and regulation, smart metering, smart grid, smart energy, power-to-gas, gas quality, biogas production, preparation and feed-in as well as new technologies. Investments in energy efficiency for asset intensive industry experience continuous growth and requires an event platform to bring its key contributors and influences together in the one space. Driven by generating genuine business connections, ener.CON Europe is committed to showcasing your products, ideas and innovations and ensuring they are shared with the right customers in a new and exciting way. end users challenges based on new regulatory (e.g. Paris Agreement and the EU 2030 Climate and Energy Framework). your tools and methods for data harvesting and data analytics to energy decision makers. a thought leader for opportunities and functionalities behind Blockchain and smart contract technologies. your opinion on how much value lies in energy flexibility and demand response initiatives. a leading partner for application models of learning algorithms, neural networks and sensors – Show your AI. chances that lie in renewable grids and teach how to adapt businesses to this new operating model. into Industry 4.0, AI, and self-adjusting systems as the new minimum benchmark for energy excellence. solutions for planning in volatile markets, predicting cost and risk in complex structures. your audience for identifying, implementing and sustaining energy saving measures.